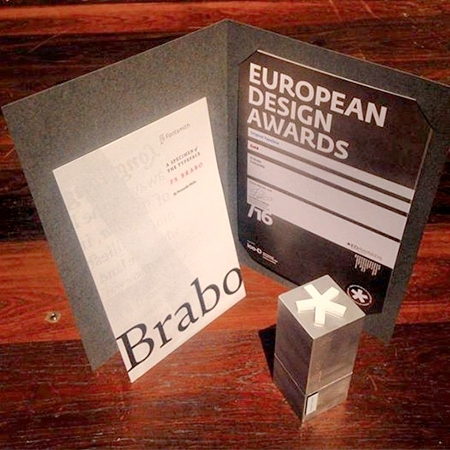 A week ago Fernando Mello collected the ‘Original Typeface’ Gold trophy for FS Brabo at the 2016 ED-Awards’ ceremony in Vienna! 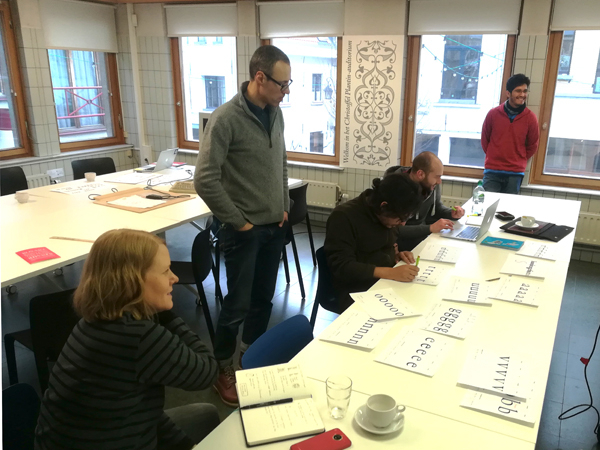 On Wednesday 16 November the Expert class Type design 2016–2017 course will start. The EcTd course comprises ten sessions at the Museum Plantin-Moretus in Antwerp during a period of roughly eight months. In between the sessions the students are expected to work hard and dedicatedly on the teamwise revival project and the new personal type design. Subscription is possible until one week before the start of the course. In the course my research and resulting PhD dissertation on Renaissance type patterning, which I successfully defended at Leiden University on Tuesday 11 October 2016, play a major role. 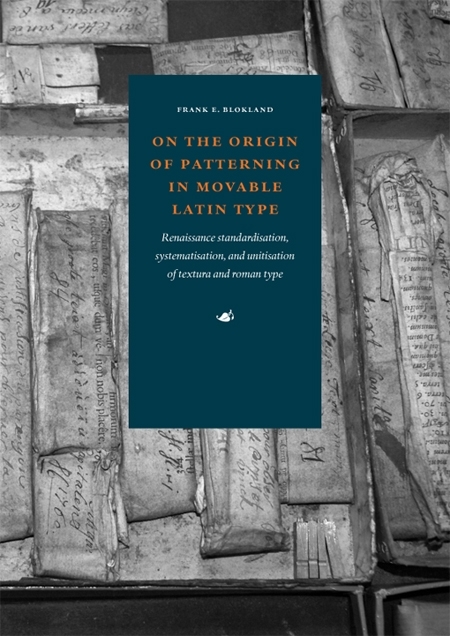 Because there is direct access to the Renaissance artefacts in the collection of the Museum Plantin-Moretus, this patterning can be easily tested and applied on (revivals of) historical type. I enjoyed a lot being a student at the Plantin Instituut's EcTd. It's the ideal place to learn about French and Flemish typographic cannons and a very inspiring setting. Wednesday 23 November Inside/Outside, the Expert class Type design / Expert class Book design 2016 exhibition, will open at Kades-Kaden in Antwerp! 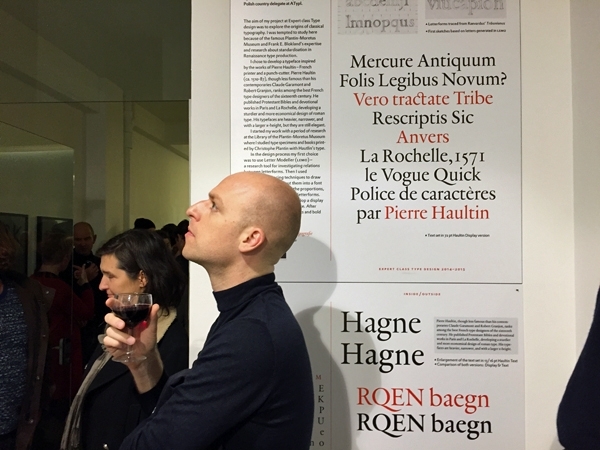 Yesterday evening the Inside/Outside 2016 exhibition of the Plantin Institute of Typography opened at Kades-Kaden in Antwerp. Kades-Kaden is the exhibition hall of the renowned design agency Catapult, where also the exhibition series Type An Sich takes place. This is the ﬁfth consecutive EcTd exhibition and the third one that is combined with the expo of the Expert class Book design (EcBd) course. The Inside/Outside 2016 exhibition comprises the further developed type designs by the EcTd students who successfully ﬁnished the 2014–2015 course and a preview of the ongoing projects of the 2015–2016 laureates. 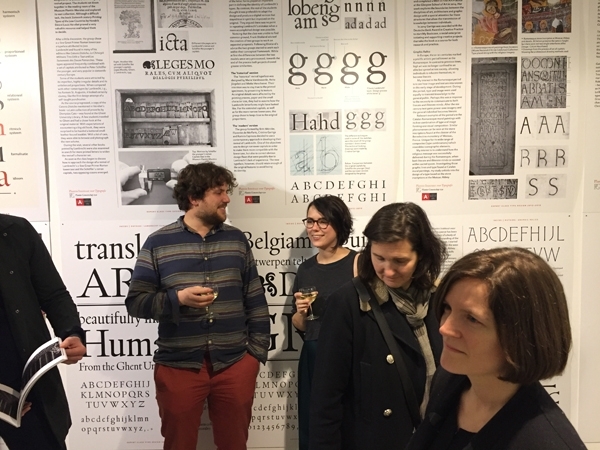 The latter show their new, personal type-design projects besides the joined revival project, which is based on the Renaissance artefacts from the punchcutter Joos Lambrecht. These artefacts can be found in the wonderful collection of the Museum Plantin-Moretus and, as you all know, the course takes place at this fantastic museum! 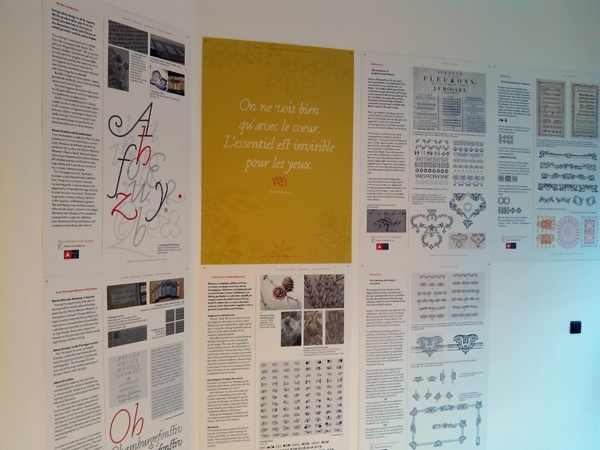 As in previous years, Agfa kindly sponsored the printing of the beautiful panels. An updated EcTd course description is now available as PDF. Now, this is a class I wish I could attend. This is right up my alley of interest. Yesterday the seven EcTd students gave nice and interesting presentations on the process and progress of their personal projects. From Guyot to Tavernier, from Van den Keere to Dwiggins, and from civilité to nifty color fonts capturing the French-Renaissance patterning. Below you will ﬁnd a small selection of photos taken at the cozy auditorium of the Museum Plantin-Moretus, where the EcTd sessions take place. 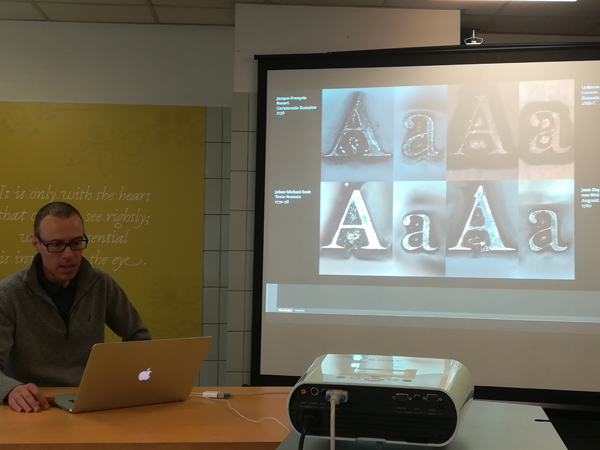 Although some TD-forum members have the opinion that being self-taught forms the best basis for a profession as type designer, there seems to be a growing group of enthusiasts who want to take advantage of the knowledge, skills, and insights of professional type designers at renowned institutes. 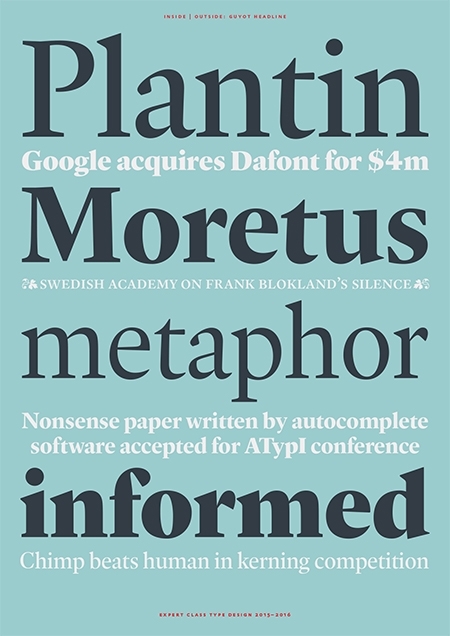 As lecturer I am extremely proud to see Ramiro Espinoza’s nicely-cadensed Guyot Headline, of which the development started at the Expert class Type design of the Plantin Institute of Typography. As colleague I admire the result. Did you mean to link to Hrant's post? While I am self-taught myself, I don't think it's better than a proper education (though I do believe it has some advantages along with the disadvantages). I don't believe being self-taught is the best basis for everybody; in the eternal words of Humpty Hump: "No two people will do it the same." 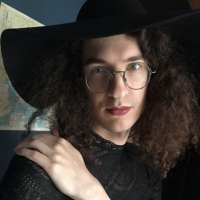 However I do feel formal education can potentially stunt the proper development of one's original voice, detracting from overall cultural progress; this is especially true in an educational environment that doesn't harbor fruitful self-doubt... and self-doubt is not how formal education tends to be sold. For individual[ist]s whose priority is making a living at the thing, this is admittedly secondary. Sorry if this is off topic a bit but I've experienced this and seen it happen to others in classical animation college. We got the Disney severely beaten into us. In my previous work, I could see a style developing and after graduation it was essentially erased. I've never been able to recapture it and to this day, my lines still have a sickly Bluth/Disney thing going on. In my previous work, I could see a style developing and after graduation it was essentially erased. Education as such should not be blamed if some tutors apply a sort of one-sided conditioning or perhaps even try to indoctrinate students. Of course, it is ﬂattering for an educator if students embrace his/her ideas, but the primary task of education is to provide a solid foundation for further development and for enhanced reﬂection. For type design this means that education should result in technical skills combined with knowledge of the historical developments in the profession (including the changing esthetic preferences during the different style periods) together with insight in (the influence of) technology. And that’s also a serious note. Dogmatic teaching can be very limiting, but in Frank’s class I never felt that the lessons were dogmatic. Frank is strict and has clear boundaries of good and bad – it can be tough to live up to those standards but they were nothing if not explicit. What I learned in proportion and rhythm took a few years to settle in, but I don’t think I ended up drawing ‘with the master’s hand’. Again, I’m sure all my old teachers will run far far away from that statement. 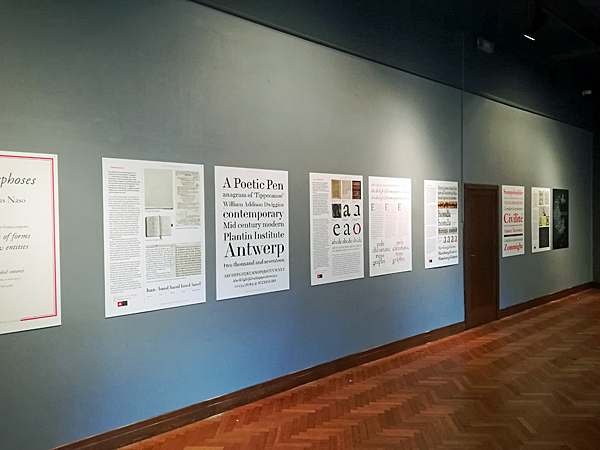 Following the Annual Academic Meeting of the Plantin Institute of Typography at the Museum Plantin-Moretus Antwerp on Saturday 30 September 2017, the opening of the exhibition In de sporen van Plantin (‘In the footsteps of Plantin’) will take place. At this expo the 2017 laureates of the courses Expert class Book design (EcBd) and Expert class Type design (EcTd) present their projects. In case of the EcTd this is supplemented with a selection of work from two 2016 laureates, which has been made after the student’s graduation and that is based on the projects started during the course’s last year. An important aspect of the EcTd course is the direct exchange of knowledge and experience between the students. 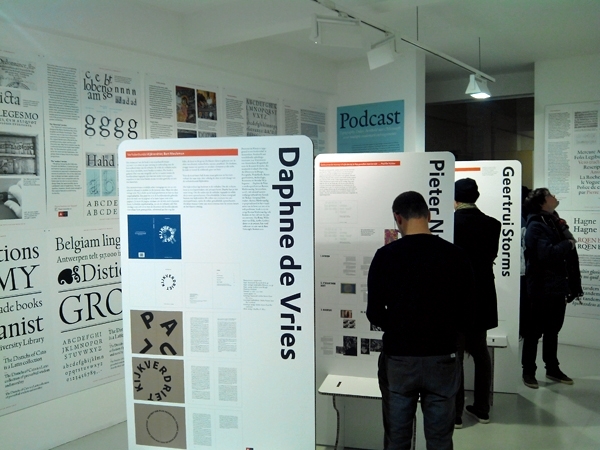 This exchange is stimulated by a type-revival project, on which the students have to work together. 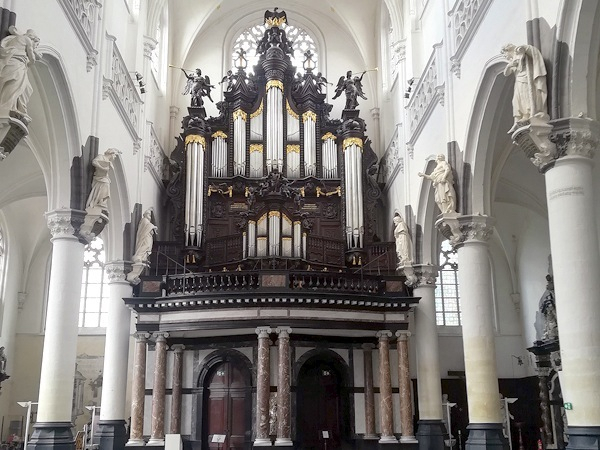 The revival is always based on unique historical material from the renowned collection of the Museum Plantin-Moretus. This year the students selected the Gros Canon Romain attributed to Claude Garamont (ca.1510–1561) and cut before 1549, and its adaptation commissioned by Plantin named Moyen Canon Romain from 1570. For the latter Hendrik van den Keere (ca.1540–1580) shortened the ascenders and descenders: this way the type could be cast in a mould for a shorter body size. 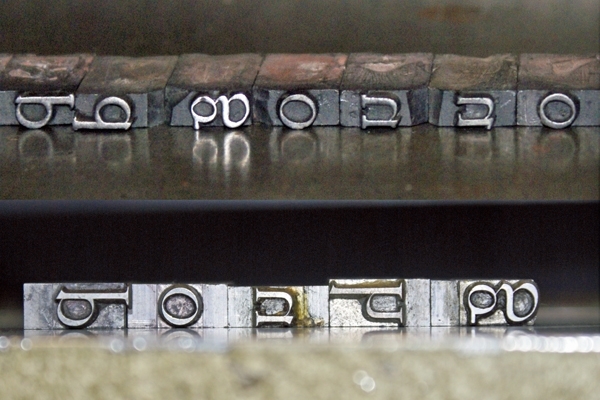 The image (from my dissertation) below shows historical foundry type of the Moyen Canon Romain (cast with ﬁxed registers of the mould) on top and the Gros Canon Romain as cast in 1959 (without ﬁxed widths). I enjoyed this year’s choice especially because the Gros and Moyen Canon Romain played an important role in my research into Renaissance type-production standardization, as one can read in my dissertation (for the record: I did not inﬂuence the student’s choice in any way). 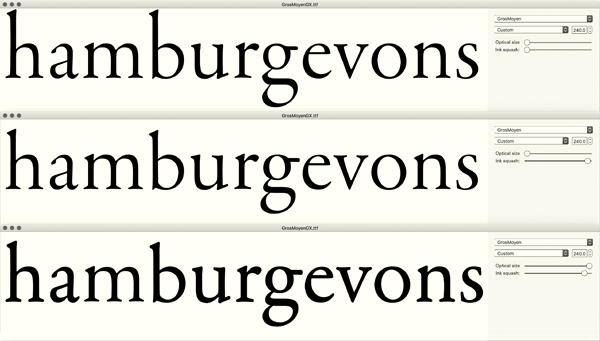 The variable lengths of the ascenders and descenders make the Gros/Moyen combination a variable font avant la lettre. Whether the Moyen Canon Romain can be seen as a precursor of the ‘Goût Hollandais’ is open for discussion (as we did during the course). After all, the Dutch type from the Baroque combined an enlargement of the x-height with an additional condensing of the letter forms, which is in line with the space-hierarchy rules (less space within the letters makes less space between words and lines possible). 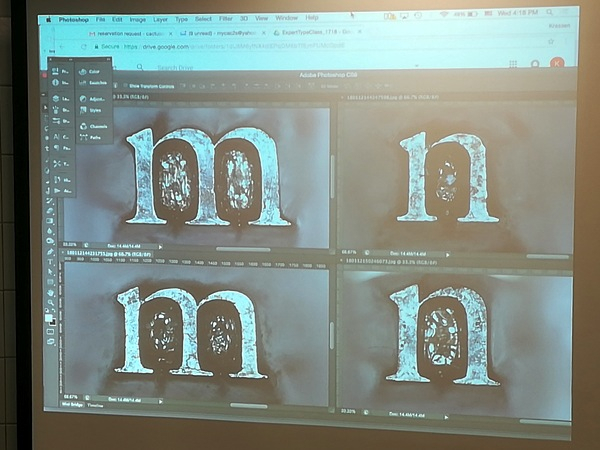 It will not come as a surprise that the students made a variable font for the GrosMoyen, as they baptized their digital revival. This font also contains an axis for the ink squashes. 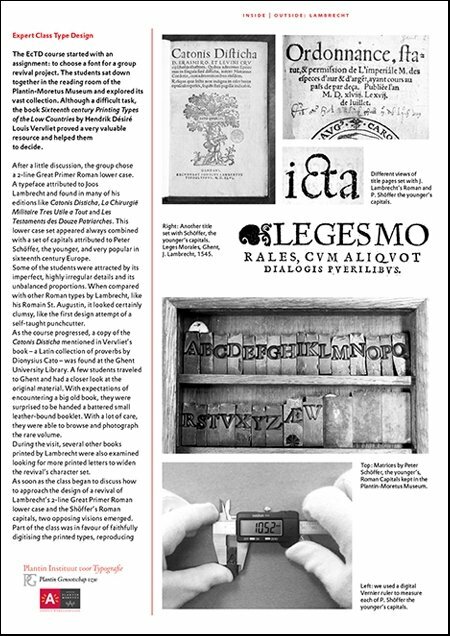 Besides taking part in the revival project, each student has to design a new typeface personally, whether completely from scratch or being a revival that is, for example, also based on material from the museum’s collection (this is not mandatory). At the exhibition a variety of projects can be seen, which includes a revival based on historical material from the punchcutter Ameet Tavernier (1522–1570), experiments with a color font on the basis of the Gros Parangon cut by François Guyot (†1570) around 1544, a revival based on William Addison Dwiggins’ Tippecanoe type from 1942, and everything in between. I would like to emphasize here that the exhibition would not be possible without the very generous sponsoring by Agfa Graphics. This is already the sixth time that Agfa Graphics provides high-quality prints on Forex A0 panels, together with the nice cardboard-based installations for the Expert class Book design presentations! In de sporen van Plantin runs in the Museum Plantin-Moretus from 1 October till 26 November 2017. 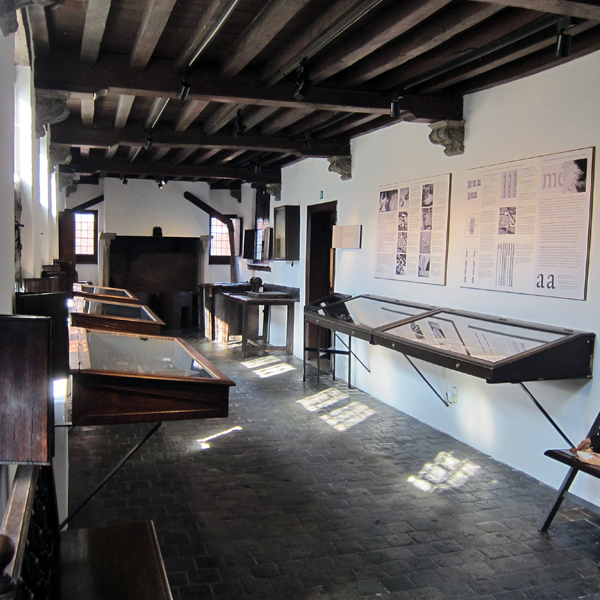 A very nice aspect of the Expert class Type design course is that the lessons take place in the Museum Plantin-Moretus. Because of this, students have direct access to the museum’s huge and amazing collection of punches, matrices, foundry type, and prints. Also this year a lot of historical material was meticulously investigated: not only for the aforementioned GrosMoyen revival, but also for a number of personal projects. 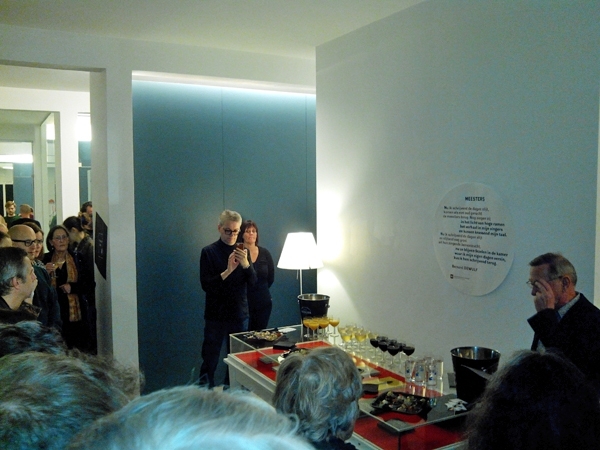 The photo above was taken in the new reading room of the Museum Plantin-Moretus. 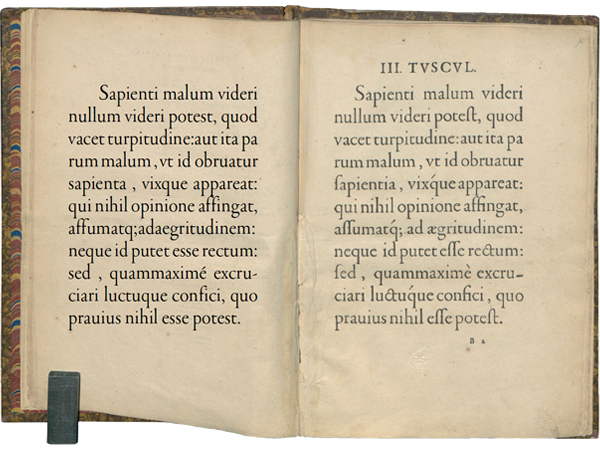 This image shows on the right page Garamont’s Gros Canon Romain in the type specimen Index sive specimen characterum Christophori Plantini from 1567. On the left the revival made by the EcTd 2016–2017 students, which is here for comparison automatically spaced using the LS Cadencer application, is presented. Obviously the long s, ﬁ ligature, and diacritics were missing still when the test was made. 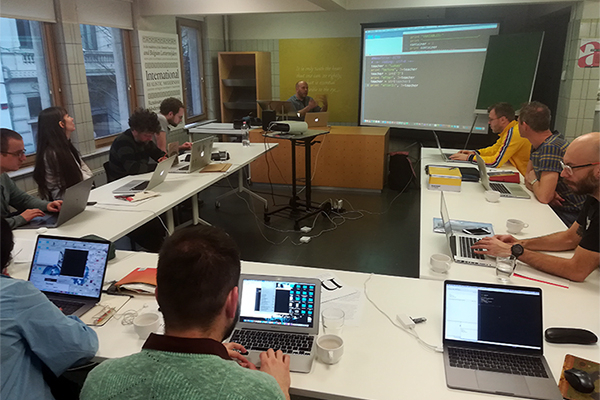 As you probably know, the LS Cadencer was developed by Lukas Schneider during the 2014–2015 course and it is interesting to see how the tool is used by the new students. 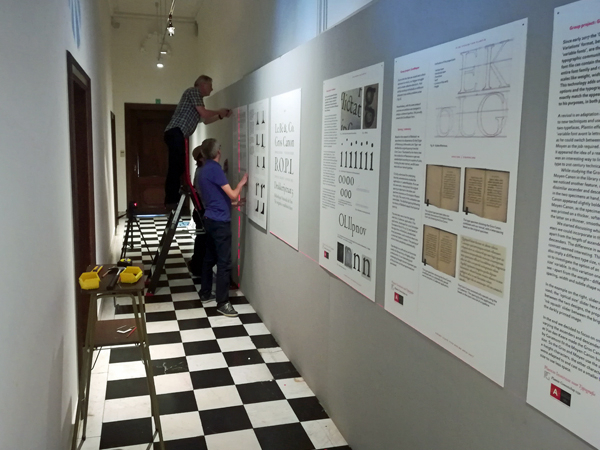 Benjamin Sporken (one of the seven EcTd 2016–2017 laureates), Erik Michiels (chairman of the Plantin Institute of Typography), Jan Van der Linden (secretary of the institute), and yours truly mounted the exhibition panels of all laureates on the walls of the Museum Plantin-Moretus yesterday. 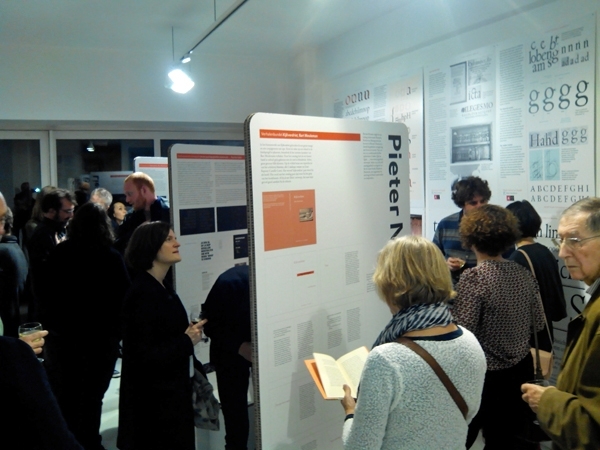 The students worked hard, intensively and thoroughly, and I am very proud of the exhibited results! Today the lighting spots will be positioned correctly in the corridor and the adjacent room, where also the panels for the Expert class Book design will be placed. 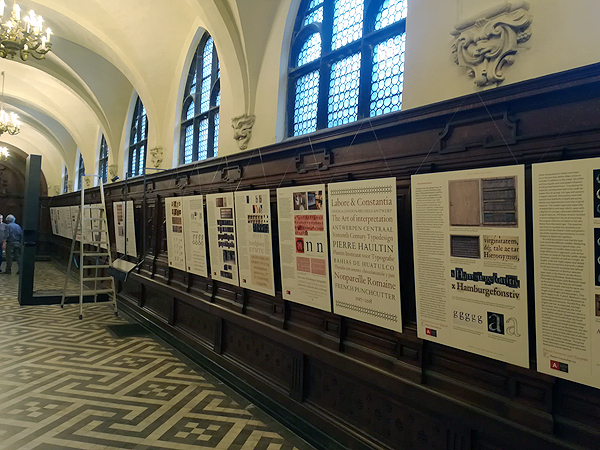 As aforementioned, tomorrow the opening of the exhibition In de sporen van Plantin (‘In the footsteps of Plantin’) will take place, following on the Annual Academic Meeting of the Plantin Institute of Typography at the Museum Plantin-Moretus in Antwerp. The expo runs from 1 October till 26 November 2017. 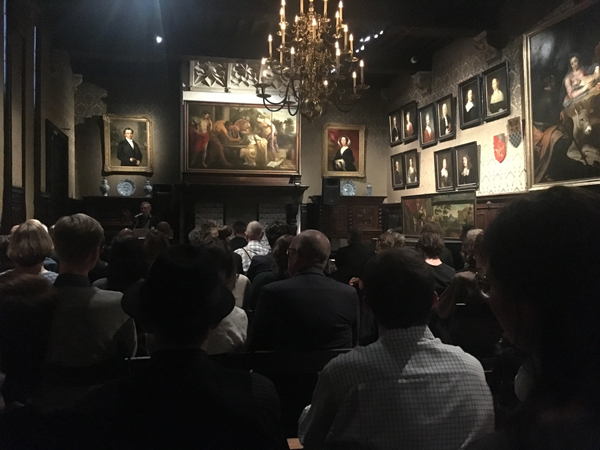 Under the approving eyes of Christoffel Plantin and his relatives, painted by Rubens and his peers, the Annual Academic Meeting of the Plantin Institute of Typography took place in the wonderful Museum Plantin-Moretus last Saturday. 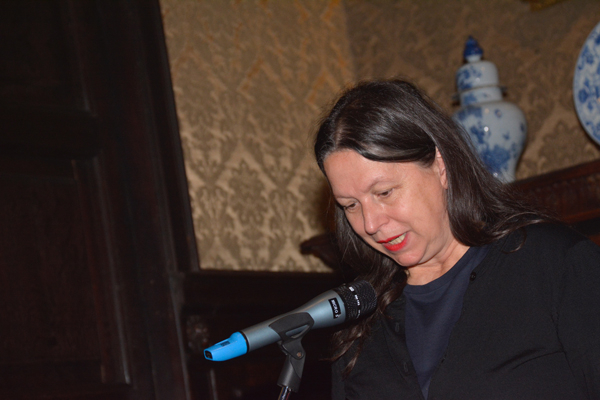 The internationally renowned and awarded Dutch typographer Irma Boom was the special speaker on the occasion. Seven Expert class Type design laureates received their diplomas: Diederik Corvers, Paula Mastrangelo, Britt Möricke, Benjamin Sporken, Daphne de Vries, Mark van Wageningen, and Channa Wijmans. We will see and hear more about them and their work in the near future, I reckon. After the ceremony the reception started in the room in which the students exhibit their projects. At the reception I gave a short talk in which I emphasized the enthusiasm and dedication of this year’s students, and the quality of the presented work. At the EcTd course in Antwerp research plays a very important role besides, of course, craftsmanship and technical insight. The course is far from easy and quite time consuming, but the students handled the tasks perfectly. BTW, the 2017–2018 course starts in November. In case you are interested, do not hesitate to contact me. 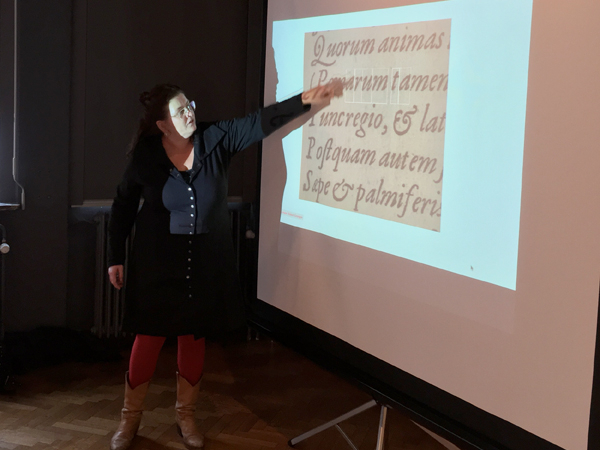 Sunday 22 October 2017 there was an information session on the Expert class Type design (EcTd) and Book design (EcBd) courses at the Museum Plantin-Moretus in Antwerp. In total four laureates –two from each course– gave a presentation on the courses in general and about their personal experiences speciﬁcally. For the EcTd Channa Wijnans en Diederik Corvers were the speakers. Questions that in the context of the EcTd always come up are, for example, what the role of the EcTd course is in a time in which type design is hardly an exclusive metier anymore, how and to what extent the fact that the emphasis in the EcTd course is a bit more on research than on the production part helps the students in their development, and what the importance is of having direct access to the wonderful historical collection of type-foundry material in the Museum Plantin-Moretus. Of course, inevitably the role and impact of the (outcomes of the) research of yours truly is also subject for discussion –as it undoubtedly also will be outside the course. If anyone on TD is interested in the EcTd: the new course will start on 15 November 2017. This PDF provides some additional information. 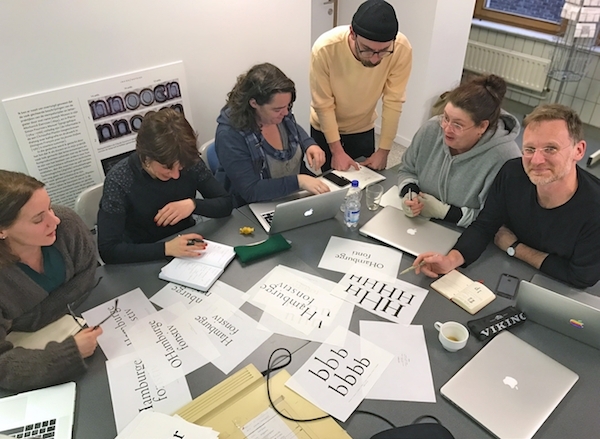 For the group’s project the current Expert class Type design students investigate the similarities and differences between a text-sized roman cut by Hendrik van den Keere (ca.1540–1580) and one of his very small roman types. The research questions are: to what extent were these types based and standardized on the same model, and how does this relate to the idea that the old punchcutters treated every size separately as a new typeface purely by eyeballing? 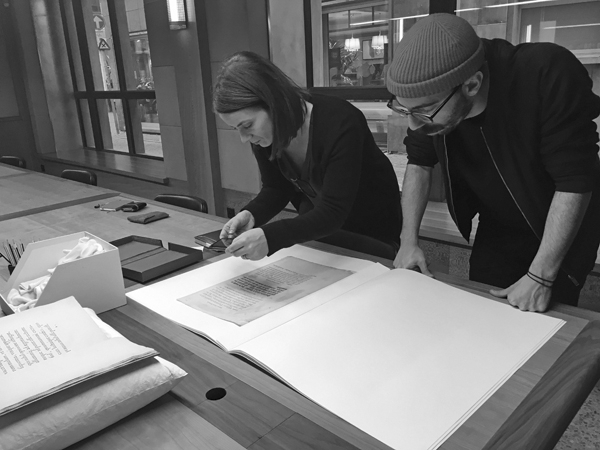 The EcTd course consists of ten sessions at the Museum Plantin-Moretus and often the students spent extra days in the museum’s library to study punches, matrices, and books from the sixteenth century that were printed with the type they investigate. Every year a private Facebook group is used by the students to intensively exchange info, knowledge, and data. During the past two sessions at the Museum Plantin-Moretus in Antwerp, the students gave presentations on the group’s project and on their personal ones, which are also based on artifacts in the museum. These sessions were highly impressive and I already very much look forward to the exhibition of the student’s work in Antwerp coming September. 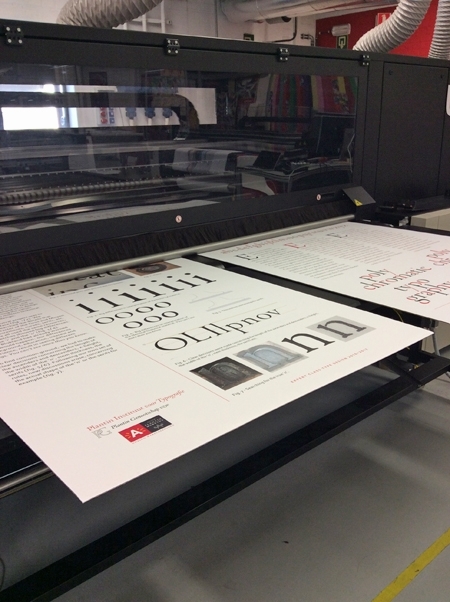 This expo will be at the Catapult gallery, within walking distance from the ATypI Antwerp conference venue. BTW, the group was unfortunately not complete when discussing the material last time (second photo). 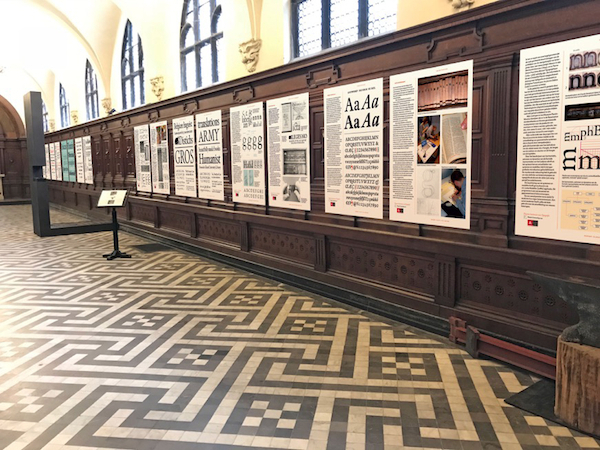 Saturday 28 April 2018 there is an Open Day of the Plantin Institute of Typography at the Museum Plantin-Moretus in Antwerp. The program starts at 10:00 a.m. and yours truly will give a presentation at 11:00 a.m. Registering for the Open Day can be done via e-mail <plantin.instituut[at]stad.antwerpen.be>. Automation and especially batch-processing of font data have been elementary and intrinsic parts of the digital type production since its early days. The IKARUS system, which was invented and developed in the 1970s, was the ﬁrst font-production tool that made the digitization of resolution-independent contours possible. The IKARUS ﬁle structure was developed with the handling of large amounts of font data in mind. Hence, it was highly suitable for batch-processing, which was controlled via an internal Perl-related command language. However, the IKARUS system was very expensive and basically only affordable for manufacturers of typesetting machines, who produced their proprietary font formats from the IKARUS data. Together with the rise of desktop publishing came a standardization of font formats, i.e., PostScript Type1 and TrueType, which eventually were combined in the OpenType format. New low-priced font tools, for example Fontographer and Fontlab Studio, emerged and the focus shifted from the manual conversion of analogue models (using a lens cursor and tablet) into IKARUS contours, to directly drawing cubic Bézier curves on the computer’s screen. Also the emphasis was not anymore on the handling of large amounts of font data. 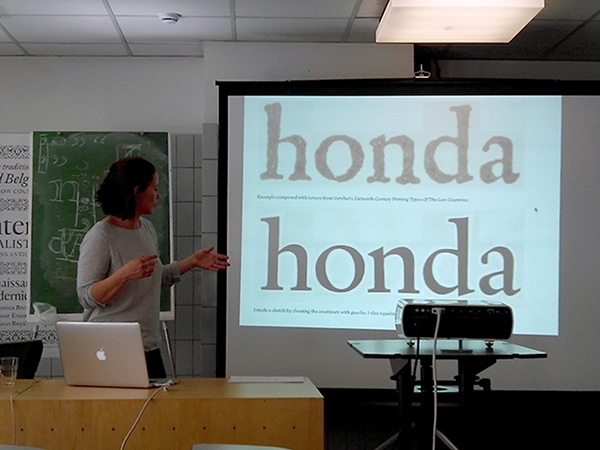 After all, the new font tools made it possible for type designers to develop their own typefaces. Although the new storage formats made it much simpler to handle small-scale font production than the IKARUS ﬁle format, scripting and batch processing had to be built on top when this became needed again. Python scripting provided the basis for enhancing the relatively limited functionality of the new font tools. Since 1995, when it ﬁrst showed up in RoboFog (a customized version of Fontograper 3.5), it has become more and more a standard in the font production. Nowadays most of the commonly used font editors, for example Glyphs, RoboFont, and FonLab VI, contain a Python-programming interface, which simpliﬁes the process of accessing data in font ﬁles –even for those who are not experienced programmers. 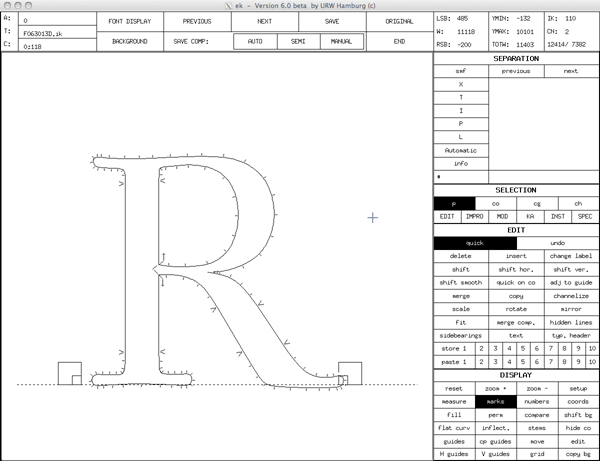 Consequently, the type designer can control, customize, and enhance the functionality of existing tools –or can even create new ones. This optional, additional functionality completely changed the mindset of many in the type profession. 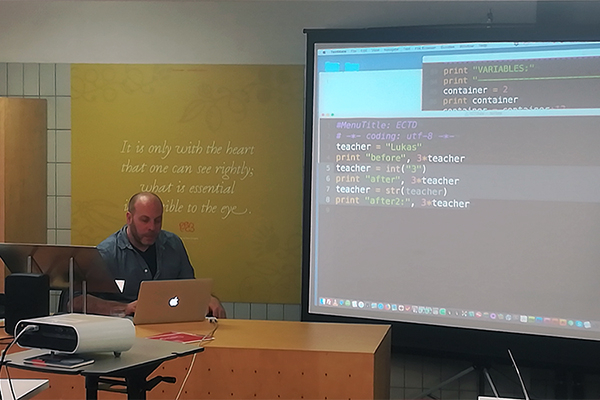 A new part of the educational program of the Expert class Type design (EcTd) course of the Plantin Institute of Typography in Antwerp, is an in-depth introduction in Python scripting. 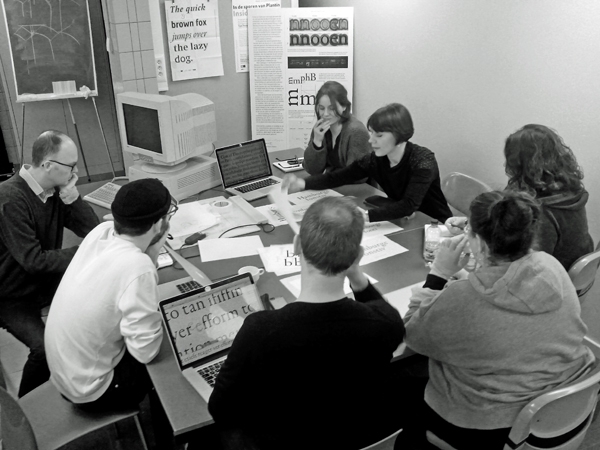 Lukas Schneider, who holds a master’s degree from TypeMedia and who is also an EcTd laureate, will provide for two daylong sessions on scripting. As an highly experienced type designer, as well as owner of the Revolver Type Foundry, Lukas is very much familiar with the handling of large amounts of font data. He also scripted the LS Cadencer tool for auto-spacing that is based on algorithms from yours truly. Currently Lukas and I jointly develop another Python tool: LS Consistencer. This small application is, as its name reveals, meant for controlling consistency aspects in batch, such as character widths and stem thickness, within a type design. 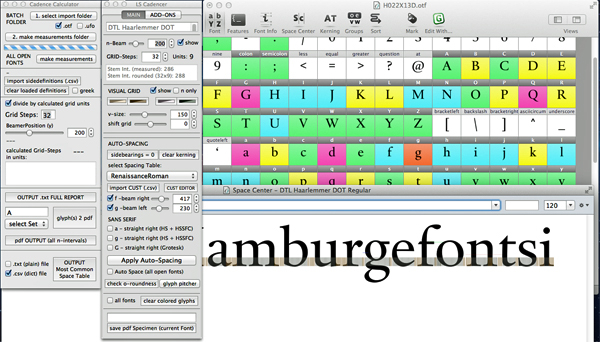 The ability to script is undeniably an advantage: after all, it makes the type designer / font producer more ﬂexible. However, during the EcTd course scripting will be, besides taught, also discussed. Is, for example, the current emphasis on scripting due to an inevitable and absolute requirement, or perhaps also the result of common present-day conditioning with certain tools? Is it possible to solve speciﬁc technical (or even design) issues by, for example, combining different font tools, instead of constantly being a beta tester of scripts? After all, it is not the purpose of the EcTd course to stir its students in a certain direction nor to judge the options, but to provide a solid general foundation on which students can base their own conclusions and, in this case, workﬂow –with or without scripting. 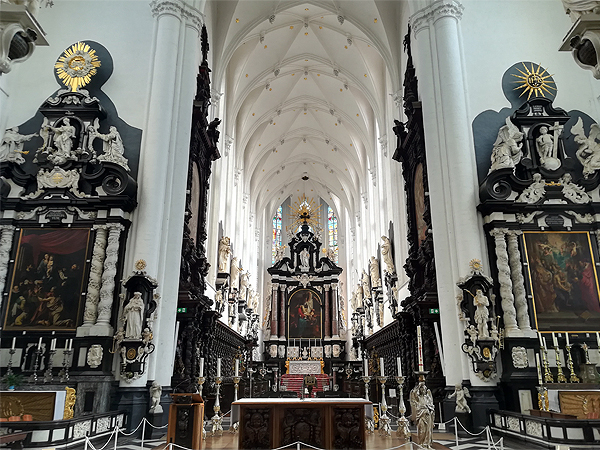 Study results from the 2016–17 and 2017–18 EcTd courses will be exhibited in the chapel of the beautiful St. Paul’s Church in Antwerp (the photo below shows an impression). The expo runs from 10 September till 26 October 2018. 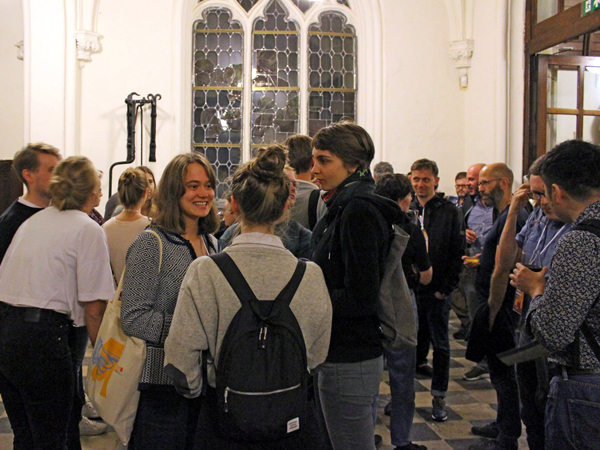 The ofﬁcial opening and reception are in the chapel on Thursday evening 13 September at 20:00 p.m. If you are planning to come, please respond to <plantin.instituut[at]stad.antwerpen.be>. In addition to the text in my former post: The third generation of the IKARUS system called IKARUS Version 3 was running in the beginning of the 1980s on a PDP-11 with an RSX 11 operating system and a RMS database system. In the mid of the 80s the IKARUS data format was changed to a platform-independent ﬁle structure, which was named IKARUS V4. This was developed for handling of large amounts of font data, which on DEC VAX computers was controlled with DCL (Dec Command Language). Around 1985 the software was completely migrated to Unix-based machines like Sun Workstations and the batch capabilities could be controlled by Unix scripts using sh, csh, bash, awk, perl, or make. 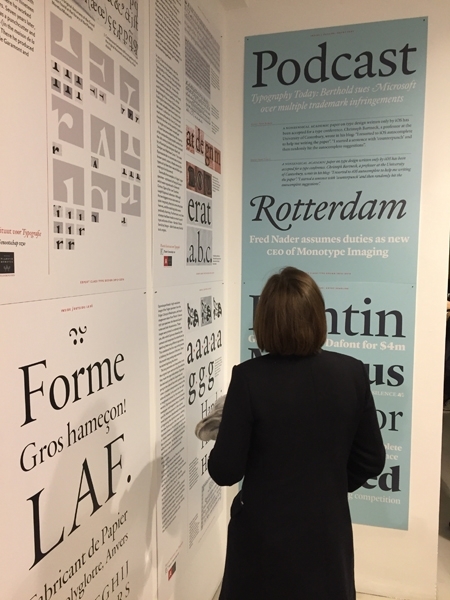 BTW, if you are attending the ATypI Antwerp conference, planning a visit to the Museum Plantin-Moretus and perhaps have questions about the presentation of the historical material in the old type foundry (and the accompanying texts), you can always contact me at the conference. Some more info can be found here. 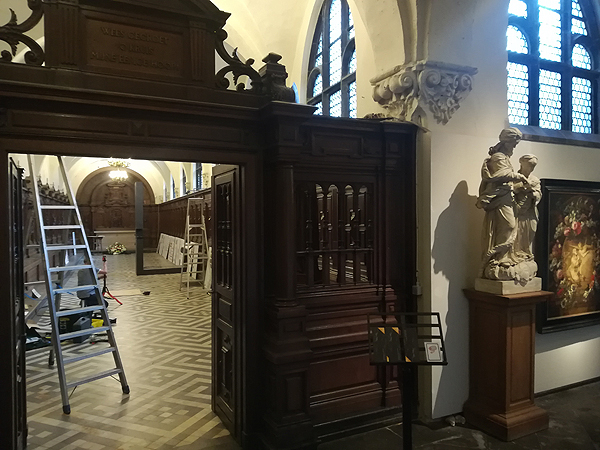 Yesterday the EcTd exhibition panels were mounted in the chapel of the beautiful 16th-century St. Paul’s Church in Antwerp. The location is marvelous, the Baroque richness of the church overwhelming. Most of the revival projects are based on Renaissance type, from Garamont to Tavernier and from Granjon to Van den Keere. 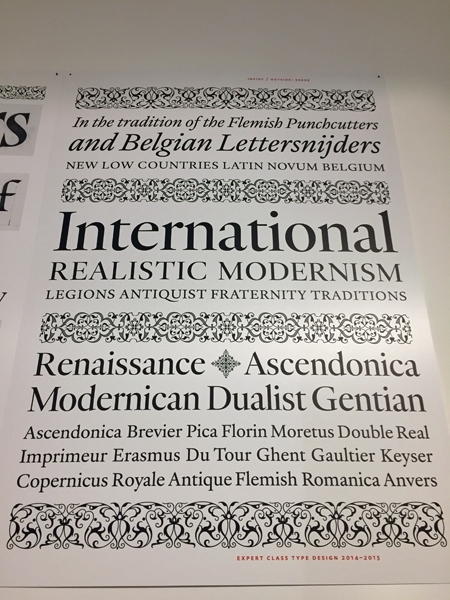 After all, the collection of the Museum Plantin-Moretus is especially renowned for this 16th-century type-foundry material. 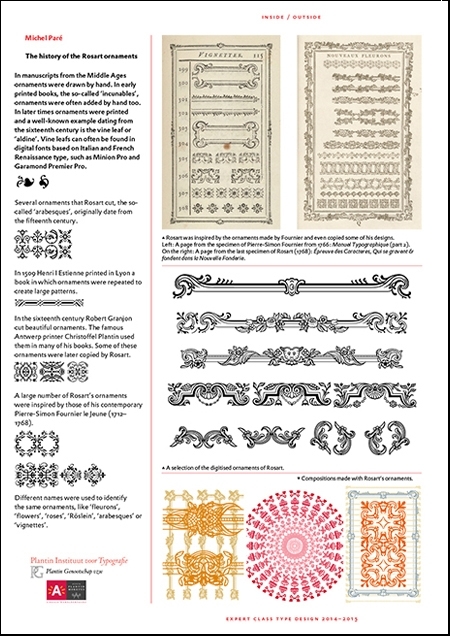 However, Baroque type is present too, especially from Jacques-François Rosart. St. Paul’s Church is at walking distance from the main ATypI conference venue. The weather forecast looks very promising for the coming week: both temperature and humidity seem excellent for a walk through the historic city center of Antwerp. 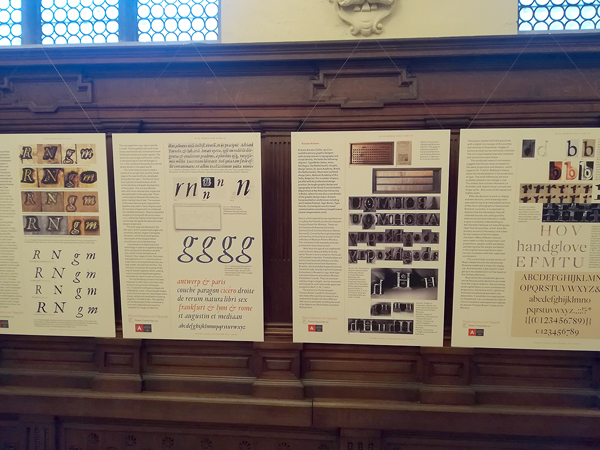 Tomorrow is the last day of the In Plantin’s Footsteps expo at the wonderful Baroque St. Paul’s Church in Antwerp. 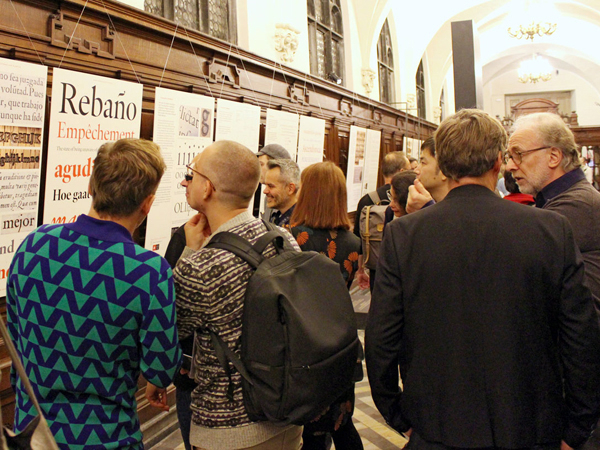 For a month and a half the study results of the Expert class Type design (EcTd) 2016–2017 and 2017–2018 laureates were exhibited in the church’s chapel. 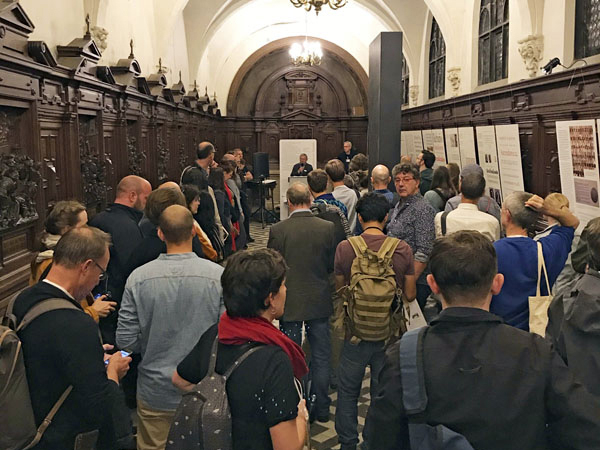 The exposition was opened on the evening of Thursday 13 September in the presence of roughly 100 interested connoisseurs, of whom many came directly from the ATypI conference venue. 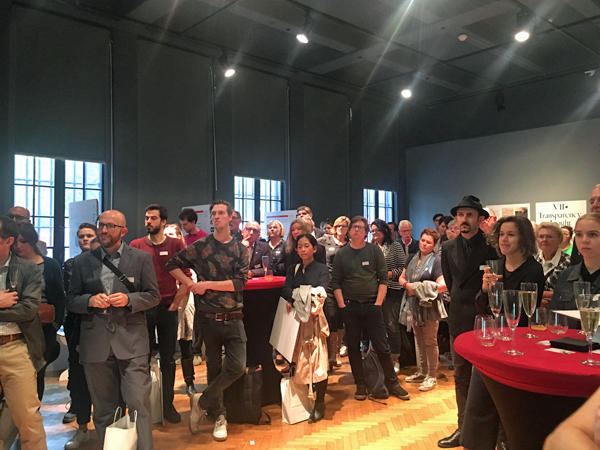 The exhibition is a great success and among the visitors in the past six weeks were a couple of the students who will follow the upcoming EcTd 2018–2019 course (starting next month). As in previous years the group is quite internationally oriented and the students come from as far as Russia and Israel. 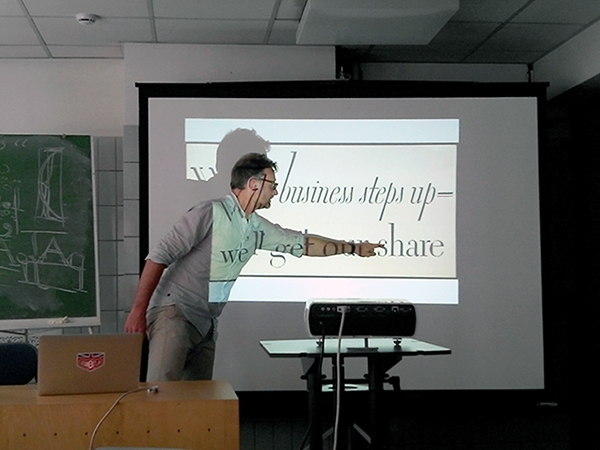 Among the speakers at the ATypI Antwerp conference were a couple of EcTd laureates. 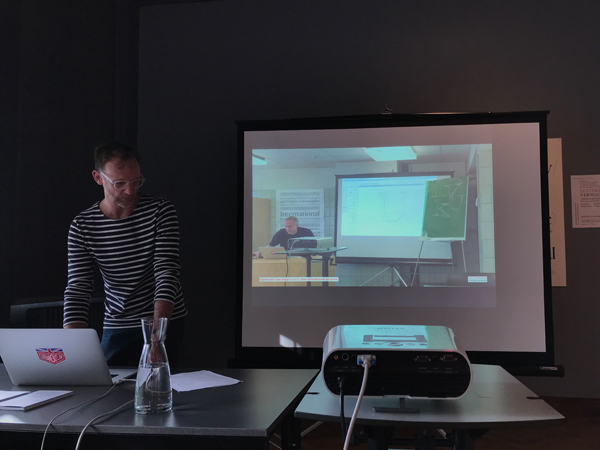 On Wednesday 12 September Elí Castellanos and Eloïse Parrack gave a talk on the 2017–2018 group’s research on the intriguing, far-reaching standardization and systematization, which can be found in the different body sizes of the roman type that Hendrik van den Keere cut. 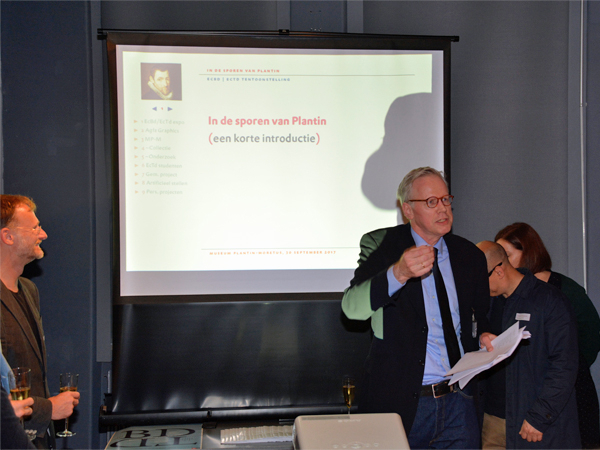 They showed the results of their in-depth investigation of Van den Keere’s punches and matrices that can be found in the unique collection of the Museum Plantin-Moretus. Also on Wednesday the 12th, alumni Walda Verbaenen and Michel Paré (EcTd 2014–2015) gave a talk on the ongoing extensive Rosart Project. In 2019 and 2020 there will be related exhibitions in Haarlem and Antwerp. 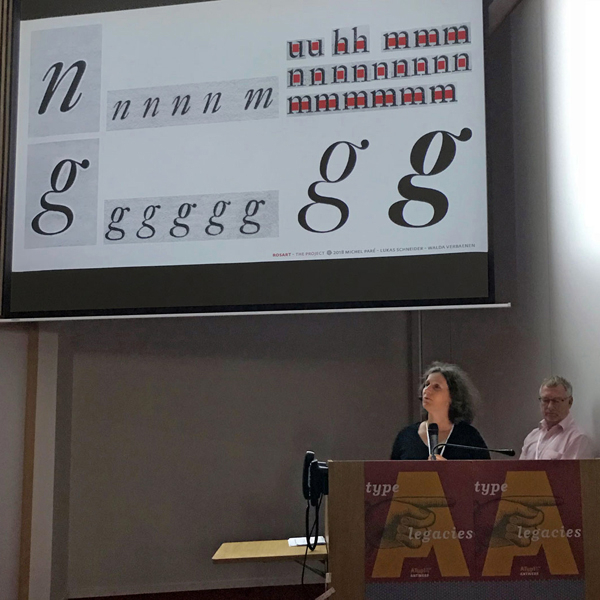 On Wednesday morning 12 September 2018 Eloise Parrack and Elí Castellanos gave a talk on the research at the ATypI Antwerp conference. 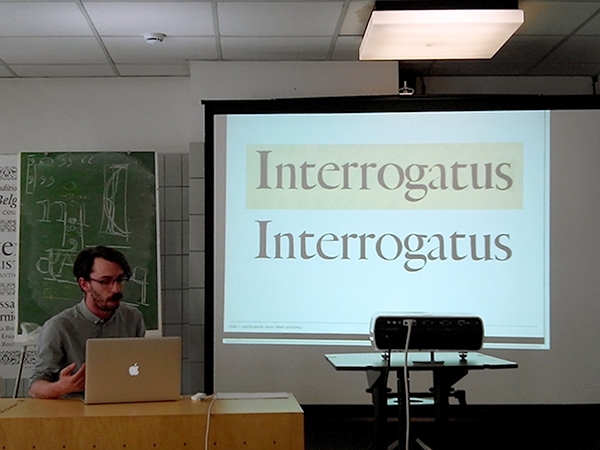 Due to technical issues with the audio capture and picture quality it took a while until the recording of the talk was posted online by ATypI. However, luckily it is available now. 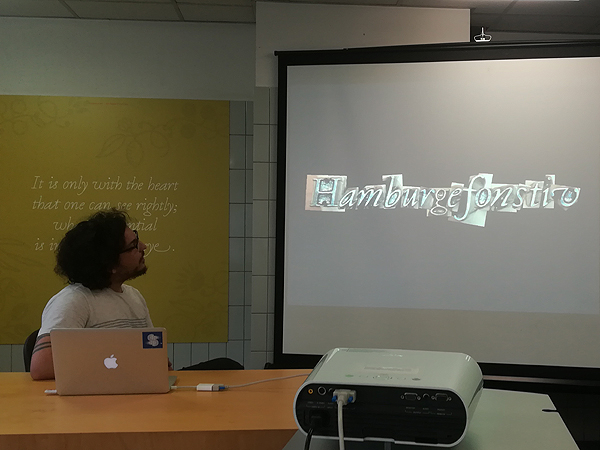 At the past two Expert class Type design sessions, Lukas Schneider, owner of the Revolver Type Foundry who scripted the LS Cadencer and De Casteljau tools, gave a very interesting and highly informative introduction on Python scripting. First Lukas explained the syntax in general and later on the focus was especially on applying scripts directly from Glyphs’ macro panel (the tool preferred by the majority of this year’s students).